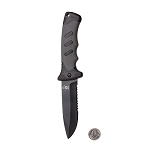 The 12 Survivors Folding BKE Knife cuts outdoor tasks down to size. Outdoor enthusiasts know a knife is the most important carry tool off the grid. Whether your cutting tasks are a function of survival, camping or hiking, this rugged folder, complete with a razor sharp 8Cr15MoV stainless steel, titanium finish drop-point blade makes any cutting job easier. 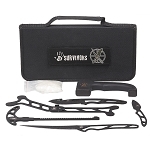 The lightweight, compact design, including a pocket clip, makes everyday carry convenient. The titanium finish, skeletonized handle and 1-in. finger hole means safer, more ergonomic handling without hand fatigue and promises years of reliability. 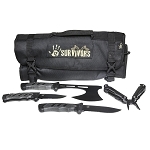 Go Ready with the 12 Survivors BKE Folding Knife.